The wine we opened on Christmas Day is one of the much-discussed in gourmet guides, wine lists, friends, ... but shared one of the most important meal of the year and with the proper pairing, we were quite surprised so many different palates. This came from the western interior of the province of Valencia, already stands in its presentation, the bottle has a label turn austere but evocative. Size bottle wine standar almost black and white label on which we appreciate a bunch of grapes that is stamped on it, the product suggests we have a different wine or at least different in its presentation. 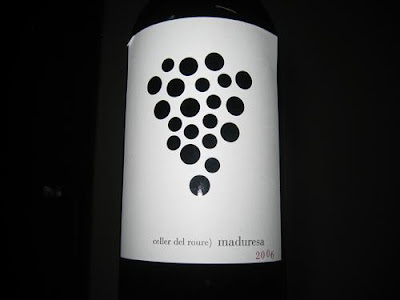 Maduresa is a wine made in the cellar El Celler del Roure, authored by Pablo Calatayud, wine is a varietal that combines native Mandó recovered and Monastrell grapes and others such as Merlot, Cabernet Sauvignon, Syrah and Petit Verdot, all grown at the foot of the Serra Grossa next to one of the most important archaeological monuments of the Iberian civilization: Les Alcusses. Returning to come tell you that we opened 20 minutes before serving, at a temperature between 14 º and 16 º C degrees, the dilemma was served in glasses, wide-mouth or not, Bordeaux or Burgundy, in the end we opted for a wide-mouth since we assume that the wine would benefit from increased oxygenation, but lose a little nose during the meal. 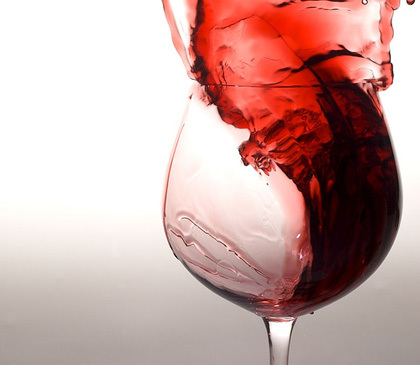 The wine was presented with a deep cherry red color with orange trim, the result of long aging, robe, shiny and satiny. The nose was quite a sight to find aromas of black fruits such as prunes, figs, blueberries and blackberries but even very mature, shaking the cup is accentuated them out while secondary and tertiary aromas and roasted coffee, black pepper, graphite and very different spices. Once in the mouth was very silky and soft, wrapped around the palate, inviting a special cream to keep tasting the wine, the tannin was at its height, its role was to clean his mouth after the succulent 'putxero amb pilota' (beef and pork sausage very cooked) we were eating and turn left mouth and tongue soft creamy. As you breathe through your nose after you swallow, even these were becoming ripe fruits and spicy memories of the wine in question. Finally a wine of good quality and good price, a wine warm, very Mediterranean and perfect for table spoon and cloth we usually prepare this holiday season and perfect for cold are accompanying us in this month of December 2010. 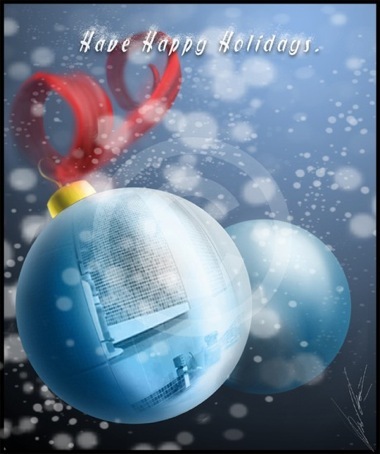 Happy Christmas!!! Feliz Navidad!!! Bon Nadal!!! Near from Requena (Valencia), about two km. about the village El Ponton, is one of the wineries that comes to the fore for its wines and cavas high end and under the direction of a group of people well known in the area, has led to the Hispano Suizas Cellar. The winery is surrounded by vineyards with mixed varieties such as Petit Verdot, Merlot, Cabernet Sauvignon, Cabernet Franc, Sauvignon Blanc, Verdejo, Muscat, Pinot Noir, Chardonnay and Bobal, at about 55 ha., a project began in late 2006 and his career starting to see the light now withhigh-end products such as Tantum Ergo cava and wine series Basus, Impromptu and Quod superius. We took advantage of this rainy day to go to the winery and knowing in this December month open days journeys, we visited the heart of the project by Marc Grin, Rafael Navarro and Pablo Osorio, accompanied by Borja, who kindly taught us the secret to make excellent wines. Our visit started with the fermentation cellar, where the varieties mentioned are from the field directly to the process, which begins with a cryo-maceration, with fermentation in oak barrels of 400 liters in open and ends on different steel tanks steel and concrete before moving on to be used in the production of champagne or the raising of wines made with time and patience. The process is quite manual, but still produced 100,000 liters of wine, with Chardonnay and Pinot Noir that used for cava, and the rest for the wines of the range. We had the opportunity to taste 2010 vintages of white such as Chardonnay, Sauvignon Blanc, Muscat and Verdejo and red as Pinot Noir, Petit Verdot, Cabernet Franc and Bobal. 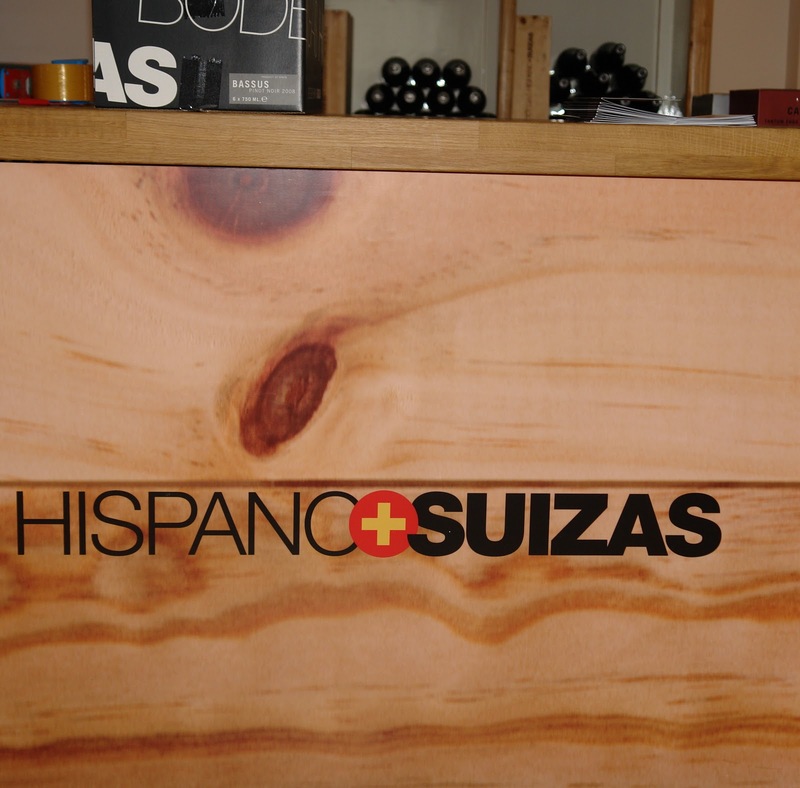 Wines after stabilization will be aging in a French barrels or secondary fermentation in the bottle for cava purpose. The cava Tantum Ergo (Pinot Noir and Chardonnay) and Tantum Ergo Rosé (Pinot Noir) are Brut Nature sparkling, which remain in rhyme at least 24 months and then behead request by hand so that they can serve as fresh as possible to consumers . The white cava is very sweet to the taste (in the case of a Brut Nature with only 3g sugar), with fine bubbles, with aromas of citrus and tropical fruits, fresh and very soft mouth. Rosé, 100% Pinot Noir, it is also quite aromatic and fresh and feels like taking nectar from red fruits with a hint of spice and vanilla. We've seen a cava disgorgement, Borja demonstration, the young winemaker has been with us this morning, has been masterful and seen the process that is usually performed (although freezing cold of the bottle neck) in this store to prepare the cava that will be distributed to customers. And the visit has not given more, stayed on the drawing board to taste wines that the winery produces and on another occasion we will taste to comment on this area of the faithful regular readers that accompany me. Organized by PROAVA and seventeen Valencian wineries, this weekend was held in the city of Valencia, specifically in the heart of Barrio del Carmen, an example of the spectacular cellars are being made in the area. CR Cava recognized the town of Requena as a producer in the Apellation, and thanks to the good work of our winneries, we are getting wonderful cavas that have nothing to envy, not to traditional Catalonia, but the best French champagnes . The basis for these wines are Macabeo grapes is a well worked, with a touch of acidity recommended for this second fermentation, which together with mostly Chardonnay and one or more variety, we have cavas clean and fresh, fruity, with fine bubbles and persistent and almost all made as Brut Nature, is staying in the caves and rhyme at least 14 months during the second fermentation and less than 3g. sugar. Noted that, although yesterday evening, the time was bleak as to what weather we enjoy such as cellars Vera de Estenas, Chozas Carrascal, Pago de Tharsys, Vegalfaro, Torre Oria, Torroja, Vegamar, Bodegas Hispano-Suizas, Daniel J Belda, Antonio Arraez, Unión Vinícola del Este, Murviedro, Beso de Rechenna... and some more that I do not remember right now. Difficult to highlight some of the cava tasted last night, they all had exceptional quality, some used, apart from the base wine Macabeo, Chardonnay barrel fermented, unfermented other, the proportions varied, some cava contained Parellada, others could not be called cava because grapes not supported by the CR Cava (case of Pago de Tharsys Blanc de negres, Bobal grape), finally each hold applies its expertise and has presented us some cava fresh and not hesitate to consume, not only for the dates approach, but at any time, as companions to a meal prepared with fish and white meats, appetizers with foie gras, eggs, vegetables, ... highly recommended this Christmas, as well appreciate the explosion of white fruit and citrus that most of them are going to produce the nose and mouth. Here you have some photos that could not be of better quality due to rain when we were surprised by the afternoon and was in no way excuse for the influx of fans and friends continue to enjoy this product well we are doing in our community. Fill your cup of emotions! "Fill your cup of emotions"
Together around the tasting of three wines from Valencia brought the hand of an internationally recognized winery. Please fill the form if you wants assist to the event. We conctact with you for details. South of the province of Cuenca, Albacete limiting, in the heart of the Manchuela, we found a small store in the village of Casas de Santa Cruz belonging to the municipality of Villanueva de la Jara, who produces wine as before. The landscape of the area really shows that the cereal monoculture vine gives life to vast tracts in a typically plain of La Mancha, and through thousands of hectares are appearing the peoples living in these crops, and huge wine cooperatives, which in these days are hotbeds of tractors and trailers laden with grapes. Paco and Feli are the owners of the Señorío de Monterruíz, people who live for cereal farming and the countryside and beautiful strains, some of rootstock, varieties indigenous to the area as Airen, Monastrell, Bobal and Cencibel. A few years ago, along with rural guesthouse who manage, decided to step back to make wine, as their parents did from the early twentieth century. They started looking for the best parcels of vineyard, old vines plots almost 60 years and they sought the best, most healthy and ripe fruit at the optimum time. Old plots were planted without regard to whether or not mixed varieties, which to make one of the different wines that today we can find, did not realize that the rules of culture DO Manchuela not allow plots producing wines of mixed varieties, and the truth is they had to label their Señorío de Monterruíz Cepas Viejas as table wine. But even if you want to compare with some wines labeled with apellation not find a wine of this nature. Señorío de Monterruíz Cepas Viejas is a wine without aging that combines varieties such as Cabernet Sauvignon, Bobal, Monastrell and Cencibel, but which followed the precise instructions that will make wine at the beginning of last century. The winery has a small facility where production is almost handcrafted wine. Thinking ahead and adhering to the D.O. 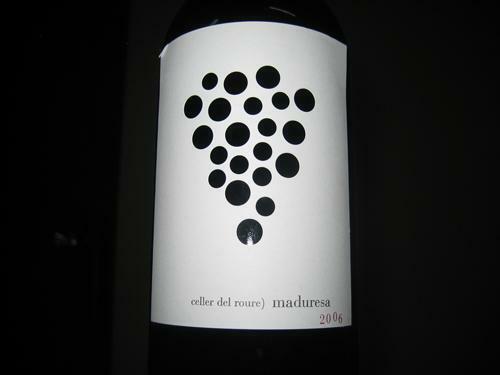 Manchuela Señorío de Monterruíz thought to develop one of the most difficult wines that entails for its variety, Bobal. So selecting the best Bobal old vines, with lots of foot free standing and some American, looking for the best 'terroir' with the most sunlight during the summer, and clay loam soils with a layer of pebbles is very characteristic of the area, decided to work this variety. Was born in 2008 the Señorío de Monterruíz Joven Bobal, a wine cellar in which opted to expand output, combining the traditional clay pots and stainless steel tanks to produce a wine without aging but with a very characteristic freshness and color of Bobal and looking for fruit and a touch of acidity on the palate that makes it quite different from other wines of the same variety. It is also made by artisans following the recipes of ancestors of the owners and under the control of the DO Manchuela and advised by a knowledgeable winemaker in the area of native varieties. During the latter half of September and October this week, have harvested about 11,000 kg. Bobal grape is selected and transported to the cellar in boxes of about 15 kg. each to then fill the tanks of 3.000 lts. and proceed to controlled fermentation using a yeast own for the start of it. In this weekend, and after racking, permanent monitoring and testing, has launched the 'racking' and manually pressing the skins to let stand this magnificent development and wait until it is bottled and time to market from the end of year. On Saturday, the first of the month of October, in San Antonio de Requena, 70 km from Valencia, there was a nice event at the winery Chozas Carrascal. It was the 1st Harvest Festival winery made it with great success and brought together a group of friends around a glass of wine in the beautiful estate of the hosts, which provided a good picture to the event. López-Peidró family turned to the present, covering, and large doses of affection in explaining their project and the successes that each day, are getting into the wine world as competitive and yet so interesting and exciting. Arrival at the winery came with a warm welcome from both Maria José, mother and daughter, who accompanied us to the area where he was Xesco, agronomist for the cellar, and Julian Lopez, our host. There, under the shade of large pine trees with a wonderful view of the farm, was being warmly welcomed the attendees with a few glasses of cava that the winery produces, as well as a dose of culture through tasting different varieties of grapes. I have to make an observation, is that this fabulous cava limited production has gained much in the last acknowledged Peñín tasting, one of the best values occurring in Requena. We continue our tour through the estate to return to the main building where guests were shown the fabulous facilities, I recommend my previous post about them to enjoy them like we did, later moving to an outdoor patio where we are still waiting some of the surprises of the morning. In this case we did a tasting of grape must. First and fermented grape must, now, a white Chardonnay grapes, wine, in the absence of stabilizing and filtering, will serve as the basis for this wonderful cava that had just taken for the welcome. We also tasted a raw juice, unfermented still Syrah grape, sweet and yet very dense, which delighted the sweet tooth and that odd boy, as the case of my son, made him feel he had also thought about them, this nectar is one of the varieties within one of the 'coupages' of the winery, it becomes a scent and flavor that magnifies some of the winery's flagship wine. And after visiting the pit, the exhibition area and shop, plus go through the always pleasant aromas of aging room, filled with barrels of the best coopers, and spent the fabulous Mediterranean garden where the surprise and warmth were to confirm what we expected, the ideal end to this event well done and perfect. In fact it was enjoying a wonderful sunny day of autumn with a lot of wine lovers and friends, entertained by the pleasant sound of the band Comic delighted us with a relaxing tune and original songs also taste the finished other wines from the cellar, and commented on by Xesco around a table full of delicious dishes typical of Requena, invited to disconnect from the intense workables days past to focus all your senses at the moment. The wine tasted Las Tres, a great white that grows with intensity over consumption, the eight red varieties with great aromas and sensations in Las Ocho, and the expected the Cabernet F 2008, a wine that has been punctuated by Peñín with 94 points in his final list, very different from the previous vintage, with great minerality, more Atlantic, more seductive nose, with a palette of aromas of undergrowth more pronounced than before and with a touch of tannin perhaps more notably, that the 2007 version. And as the culmination of a sweet tasting special Garnacha and is limited to 800 liters in total, not cloying in the mouth and tries to convey more feelings fruit, despite being a wine called 'dessert'. We ended up with a present from the cellar, which was the memory of the visit and the special day. We also had the opportunity to purchase products directly from each of the participants best enjoyed, taking in the memory in mind that these wines and cava and lived in company shares from the dream of this family will remain in our way much longer.